mental toughness – it’s a beautiful thing. 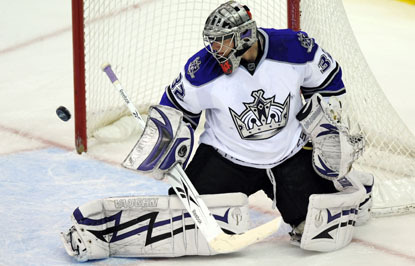 i don’t know if there are too many athletes that are mentally tougher than NHL goalies. as i watched the kings game tonight, i thought about how incredibly resilient goalies have to be when they get scored on, when their teams lose, or when they get pulled from the game. as much as i liked taunting the opposing team’s goalie (from my couch, no less), a part of me felt bad for the dude. when your team loses, it’s always possible to walk into that locker room thinking your effort or lack thereof made the difference between winning and losing. think about the toll that could take on someone who isn’t mentally tough. they are the gatekeepers to the holy goals that win games. they shoulder the team and tend to take the blame when a team loses. after all, it is about how many goals the goalie lets in to the net. to be a good goalie, you have to be willing to let go of that goal that was just scored on you and forge ahead. for many people, goalie or not, it’s hard to let go of the last moment they felt defeated. but letting go is what will let you save that next shot; lingering too long over the last shot you let in just makes you vulnerable to another. to be a good goalie, you have to be willing to fall, flail, block, stretch, dive, and dip, only to get right back up again. you have to put yourself out there and that’s scary. this willingness to stand in front of a puck, even with all that padding, is mighty brave. to be a GREAT goalie, you have to let go of the losses and hold onto the wins. losses can cause self-doubt in anyone and you can’t listen to that voice. you have to trust yourself despite the losses. doubts and second-guessing can lead to wishy-washy choices, and when i say that, i am talking about life just as much as i am talking about hockey.